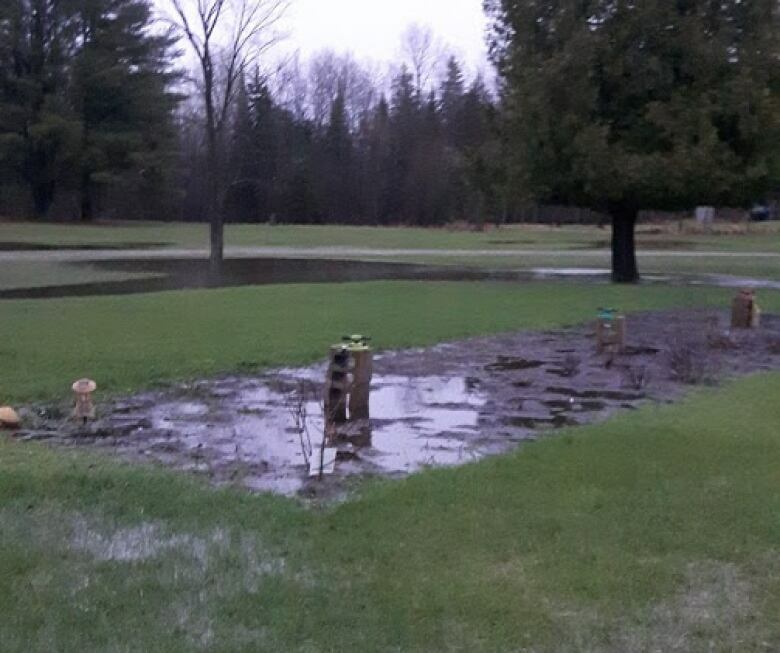 When record rainfall drenched Eganville, Ont., last May, Mother Nature spared Laurie and Doug Bennett her worst. The couple says it was the township's response to the ensuing flood that left them in a state of crisis. Twelve months later, they say their property, about 135 kilometres west of Ottawa, is still waterlogged after crews pumped water away from neighbouring houses. It all began May 1, 2017, when some houses across from the couple's Foymount Road home began to flood. "The neighbours couldn't drive down the street across the road. It was so deep they would have flooded out their vehicles," said Laurie Bennett, 58. What happened next shocked her. 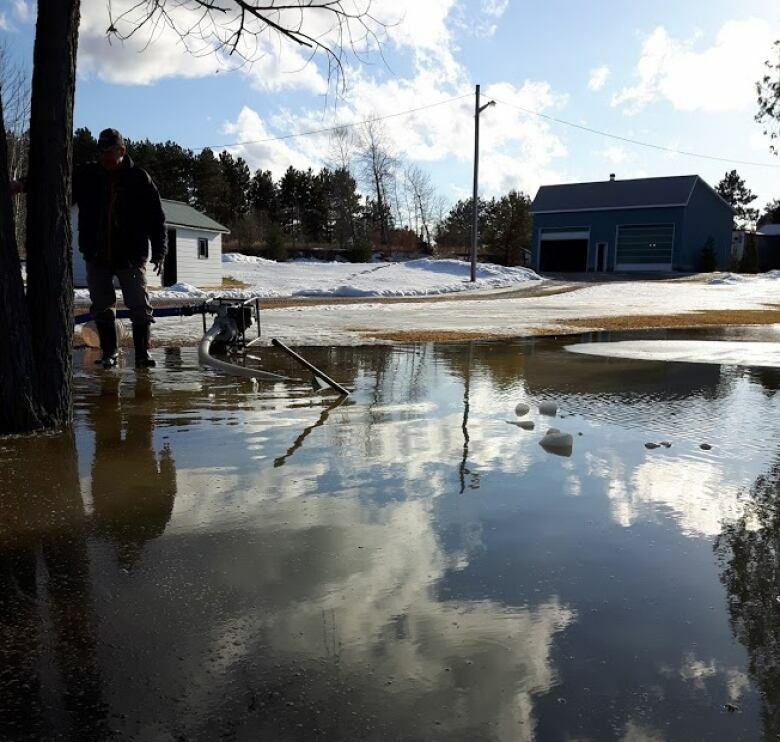 Bonnechere Valley Township crews set up a large pump in the middle of the flooded area, Bennett said, and proceeded to pump the water through a culvert under the highway, sending it onto her own land. "Our property was swamped. It was flooded up to the septic bed," Bennett said. "The garden was flooded. It was horrible." Fearing for her well and septic system, she made panicked calls to the township's superintendent of roads as well as the mayor, asking them to stop. She was told crews would continue pumping because they were simply helping the water along its natural drainage route. The next day, the township agreed to drain the water by arranging for a new ditch to be dug, running from the road toward the rear of the Bennetts' property and channeling water into an existing drainage ditch. The Bennetts expected the township would fill in that ditch, which was dug on their next door neighbour's property, after the emergency. It hasn't done so, and the Bennetts said their yard is now constantly full of water. "Every time there's a melt, every time there's a rainfall, our property is flooding," Laurie Bennett said. "I'm not sure why, but since that ditch has come into play, our property no longer drains. So we're pumping water." A year later, the Bennetts said they're exhausted from the constant effort to drain water into a nearby swamp to preserve their septic system. "The pump is heavy. It has to be lifted onto a trailer," said Laurie Bennett, adding that she suffers from the muscle disorder fibromyalgia. "The hoses are heavy when they're full of water ... it takes everything I've got to lift the bricks that hold the hose down." While the pump runs, Doug Bennett, 69, who has serious health problems that have left him unable to work and unable to safely lift heavy things, needs to keep constant watch to prevent the hose from becoming clogged. They even pumped through the winter, Laurie Bennett said, hauling the pump inside each night and emptying the heavy hoses so the water inside wouldn't freeze. "I'm just stressed to the max," said Doug Bennett. "We even hear a forecast of rain and we just go, 'Oh, my God, we're going to be in trouble again.'" Laurie Bennett worries about her husband overexerting himself while she's away at her full-time job. She does most of the couple's laundry at a laundromat to avoid overloading the septic system, and said she's given up visiting family in Thunder Bay lest the property flood while she's away. The nightmare has also interfered with the couple's plan to move house. They'd been planning to sell when the flooding happened last spring. "It's time to downsize, but we can't do that until this is fixed," Laurie Bennett said. Bennett has asked the township to fill in the ditch, or consider building a new ditch across the highway to drain water to a large creek about 650 metres down the road. However, the top official at the Township of Bonnechere Valley denied the ditch is the problem. "I think that the groundwater table in that area just has not returned to its normal state yet, and likely if we don't get an excess amount of rain this year, that should all remedy itself," said Bryan Martin, the township's chief administrative officer. As for the township's decision to pump water toward the Bennetts' yard last spring, Martin said crews were simply doing their job to drain a municipal road, and used a culvert that has been part of the drainage system for many years. Martin said any decision to create a new drainage ditch, as the Bennetts have suggested, would be up to Renfrew County. "It would be an extremely expensive undertaking, and it was one I don't believe the county engineers were interested in recommending at the time," he said. Martin said it's not clear to him whether the Bennetts actually need to pump the water that's accumulating, but the township's roads department has worked with them to find a solution. "I think that the roads department has gone far beyond what is required of us as a municipality as it relates to trying to remedy a problem that is now a private property matter," Martin said. 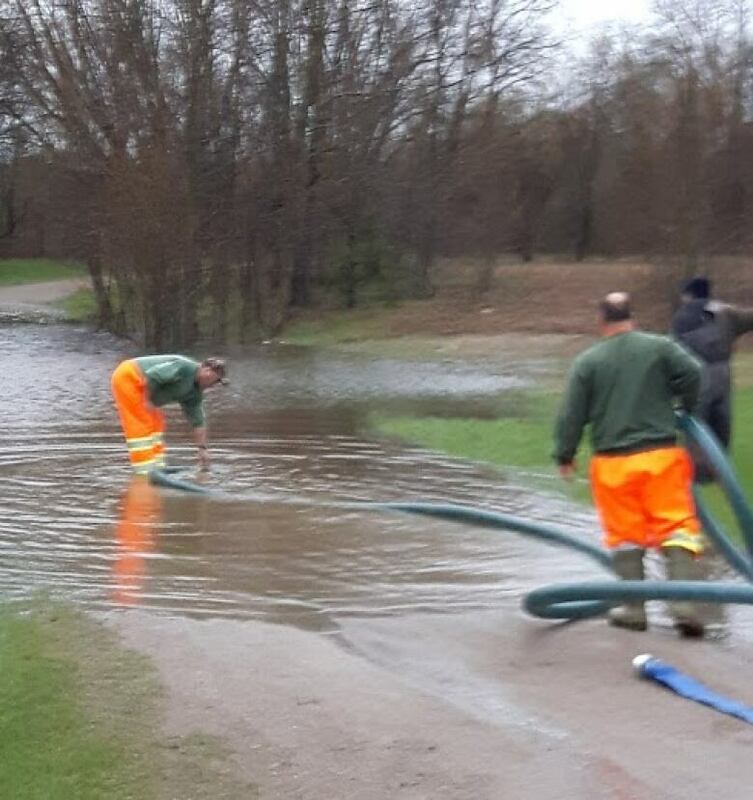 Without an independent drainage expert to assess the property, the Bennetts can't be sure of the true cause of the excess water filling their yard, or the best way to deal with it. Without actual damage to the house — which so far, Laurie Bennett said they've prevented by pumping — she can't make a claim under her home insurance. The Bennetts have sought help from the office of their MPP, John Yakabuski, as well as the Ontario ombudsman. Both have suggested they consider consulting a lawyer. "We don't have the money to go through a civil suit," Bennett said. "We don't want to spend years in court. We need our quality time back." As for Ontario's Disaster Recovery Assistance Program, a spokesperson told CBC by email that the program "focuses on the essentials," such as replacing damaged furnaces and appliances. "The program does not provide financial assistance to help with the long-term needs you describe," the spokesperson said, suggesting homeowners in such a situation check with their municipality or the provincial ombudsman. "We are both just exhausted," said Laurie Bennett in an email. "Anyone we have tried to contact hasn't helped." Disputes such as the one between the Bennetts and their township will only multiply as climate change disrupts weather patterns and resulting natural disasters alter the landscape, according to lawyer Laura Zizzo, founder and CEO of climate change management consulting firm Zizzo Strategy Inc.
"Although it's impossible to say that any one event is specifically related to climate change, we know we're seeing a trend," Zizzo said. "And the trend in Canada is water. More water where we don't want it, more water where it didn't used to be, less water where we might want it." In the U.S., insurance companies have sued municipalities on behalf of their customers for not considering climate change impacts and protecting against floods, Zizzo said, though typically such fights involve homeowners hooked up to municipal water and sewer services. Increasingly, governments will need to invest in infrastructure to prevent flood-related impacts, as well as in programs to help individuals in crisis handle the bureaucracy of recovering from a disaster, Zizzo said. Meantime, the Bennetts are living in fear of a repeat of last year's extreme rain. "We would be totally flooded out. That's not even a guess," Laurie Bennett said. "It's frightening."